The tracts of land today known as Swann’s Point and Mount Pleasant boast a rich architectural history stretching back to the very early days of Virginia’s settlement. Peace with the Indians following capture of Pocahontas and her subsequent marriage to John Rolfe lulled the colonists into believing that cohabitation in the new land would remain harmonious. In this hopeful atmosphere, plantations sprang up on the south side of the James River, across from Jamestown, results of an ever-expanding effort to reap the financial rewards of the New World. In 1620 Richard Pace, an ancient planter, patented land on part of this tract and developed a small, fortified settlement. With the death of Pocahontas in 1617 and the rise of Opechancanough as the great werowance, it was only a matter of time before the natives moved to exact revenge for their mistreatment by the English. The Indian uprising of 1622—the “Massacre” as the English called it—combined with disease, famine, and the effects of “seasoning,”—nearly destroyed the colony. “Paces Paine,” as this tiny palisaded enclosure was called, played an historic role in the outcome. Chanco, a Native American convert to Christianity who was living in the Pace household, reported to the impending attack to his master, and authorities in Jamestown were quickly alerted. Nonetheless, many settlers died in the assault, necessitating a pull back to the Jamestown fort. Chanco’s decision to side with the foreigners sealed the fate of the Anglo-Indian relationship. Recent archaeological testing under the direction of Nicholas Luccketti has the located the likely location of Paces Paine in a field northeast of the main house. Pace’s property became part of a larger tract, Swann’s Point, patented in 1635 by William Swann. The eastern end of this vast parcel, fronting on Gray’s Creek, was the scene of significant development in the seventeenth century. The western end of the property, the Mount Pleasant tract, was first improved by Pace, but otherwise remained undeveloped until the end of the seventeenth century. Luccketti’s excavations have identified what may be the remains of several buildings from this period: a slave quarter site at the far west end of the field to the west of the house, a house with a brick chimney but presumably with earthfast posts in the field to the south of the house, and an earthfast building in the yard immediately to the north of the house, under the filled terrace of the river-front garden. It would appear that these improvements were made by Major Samuel Swann. Interestingly, Swann was disliked by Virginia Governor Francis Nicholson. He moved to Carolina and there married Elizabeth Lillington, the governor’s daughter of his newly adopted colony. The next owner of the property, Joseph John Jackman, was an uncle of Arthur Allen of Bacon’s Castle, and acquired the property from Samuel Swann in 1706. Within three years, Jackman transferred the property to George Marable I of Jamestown. Thereafter it quickly passed through him to a relative, John Hartwell. John and Elizabeth Hartwell’s daughter (also named Elizabeth) married Richard Cocke IV of Surry County. Richard’s brother was Benjamin Cocke, who married the daughter of Arthur Allen of Bacon’s Castle. The Cockes were a distinguished Virginia family. Richard I immigrated about 1630, and by 1632 was a member of the assembly and was a lieutenant colonel in the Henrico militia. The family had vast holdings, including the plantations Malvern Hill[s?] and Bremo. Through astute marriages to other gentry families and cultivation of their land (mainly in tobacco), the Cockes were able to build a significant empire. As second sons, however, Richard IV and his brother Benjamin were forced to take up land outside of the family holdings in Henrico. They married well in Surry County, sustaining the social and economic positions they had come to enjoy. By the time the first English settlers arrived at Jamestown in May 1607, Native Americans had been living in what is now Surry County for thousands of years. The Quiyoughcohannocks, the local Algonquian Indians encountered by John Smith and his fellow colonists soon after their arrival, were the distant descendants of hunter-gatherer groups who had roamed Virginia’s Southside since the last Ice Age. Virginia’s first inhabitants, the Paleo-Indians, arrived in this region around 9,500 B.C. At that time, Virginia’s climate was significantly cooler and wetter, and, with the glaciers still receding, sea level lay more than 180 feet below what it is today. The Paleo-Indians lived in mobile bands and hunted large game animals, including mammoth, mastodon, deer, and elk over a wide, but defined territory. The distinctive material culture of these peoples included fluted projectile points crafted primarily from relatively scarce cherts and jaspers. Though Paleo-Indians may well have occupied the vicinity of Mount Pleasant in the course of their annual movements through the region, the probability of finding archaeological evidence from this era is slight. As the glaciers continued to melt, sea levels rose rapidly throughout the Mid-Atlantic region between about 8,000 and 3,000 B.C., dramatically altering the physical and natural environment. During this period, Paleo-Indians were gradually replaced by larger populations, known to archaeologists as the Archaic peoples. Based on archaeological evidence, researchers speculate that Archaic hunter-gatherers, like their Paleo-Indian predecessors, moved continually throughout the region, occupying large, multi-family base camps during certain times of the year, and dispersing into smaller groups to make use of natural resources as they became available. The typical Archaic toolkit included a number of new, more specialized implements, including adzes, notched axes, and grinding tools, suggesting an increasing reliance on plant materials and foods. By the end of the period, it appears that Archaic peoples were becoming more sedentary, with a resulting growth in population and better definition of group territories. The recent comprehensive archaeological survey of Mount Pleasant has discovered extensive Archaic occupation in the south field, while an especially artifact-rich Archaic period site has been identified in the small upriver field. Rendition of archaeological plan of late Woodland Long House from Paspahegh, James City County. By about 1,200 B.C., the lifeways of native peoples along the James River and throughout Virginia’s Coastal Plain were beginning to change in profound ways. This new era, defined by scholars as the Woodland period, witnessed a gradual transition from seasonal hunting and gathering to a more sedentary form of existence, with an increasingly complex social structure and an economy based primarily on agriculture. One of the most obvious material culture developments characteristic of the Woodland period was the introduction of pottery. The late sixteenth and early seventeenth centuries marked the height of the Late Woodland period in Virginia, an era characterized by a highly sophisticated economic and social structure, with diverse cultural traditions and large-scale interaction between different groups. This period, which roughly spanned the years 800-1607 A.D., saw the emergence of large villages occupied throughout the year, with resident populations that often numbered into the hundreds. These large groups were sustained by domesticated plant foods such as maize, beans, and squash, and supplemented by fish, shellfish, game, and wild plants. More is known about Woodland sites than those of any earlier period. Most were located within estuarine or riverine settings, and ranged from villages and hamlets to small seasonal camps and resource procurement stations. Many of the largest sites were occupied for relatively long periods of time. 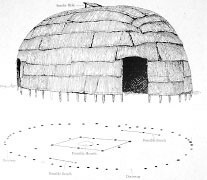 Due to changes in subsistence economies and technologies, sites of this period often left tangible archaeological evidence such as postmolds associated with longhouse structures and defensive palisades, cooking and trash pits, hearths, and individual and multiple ossuary burials. While some villages were characterized by densely clustered residences, others were more dispersed in plan, with houses separated by agricultural fields. When John Smith arrived in Virginia in 1607, he and his fellow English settlers unwittingly stumbled into the midst of the Powhatan chiefdom, one of the most complex Native American groups on the eastern seaboard. The paramount leader Powhatan commanded the allegiance of local chiefs, or “weroances,” in thirty-one different districts, including a total population of approximately 13,000. 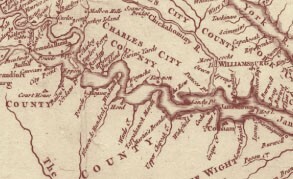 In the early seventeenth century, the various Indian groups living on the south shore of the James River had only recently been brought under Powhatan’s dominion.